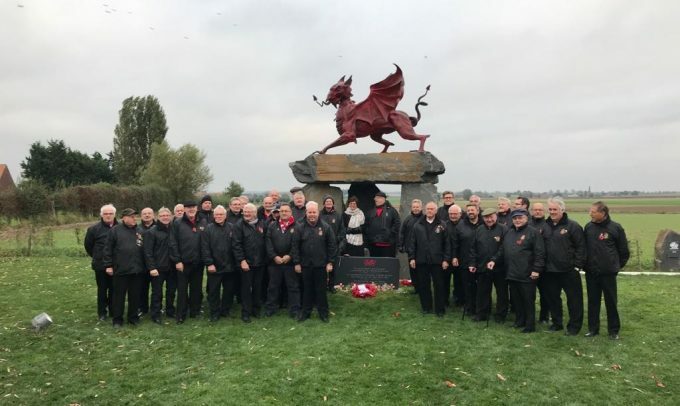 Côr Meibion Colwyn (Colwyn Male Voice Choir) have returned from a tour of Ypres in Belgium to pay their respects o the fallen of the First World War. It was privileged to sing as part of the Last Post Ceremony at the Menin Gate in Ypres where representatives of the choir also laid wreaths on behalf of the choir and the Bay of Colwyn Town Council. The choir held two concerts during the 5 day tour, including one in the impressive St Martin’s Cathedral with its amazing acoustics. At that concert we met up again with a Belgian family, local to Ypres, who had been to one of our summer concerts at St Mary’s Church Betws y Coed. Our last Concert on the eve of our departure for home was in the historic St George’s Memorial Church in Ypres as part of their impressive Poppy Cascade from the church tower and its external walls. 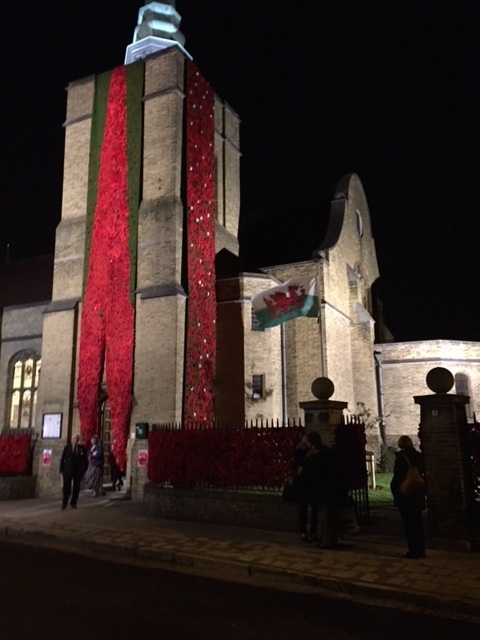 We attended the service of commemoration and blessing of the Poppy Cascade followed by a reception in the memorial hall and the evening concluded with the concert. The church itself was completed and consecrated in 1929 following an appeal to commemorate the half a million plus of British and Commonwealth troops who fell in the three battles fought for the Ypres Salient during World War 1. Within the church it has many plaques, standards and memorials to regiments, associations and individuals. It is part of the Diocese of Europe and the Church of England and the George Cross flag is flown. 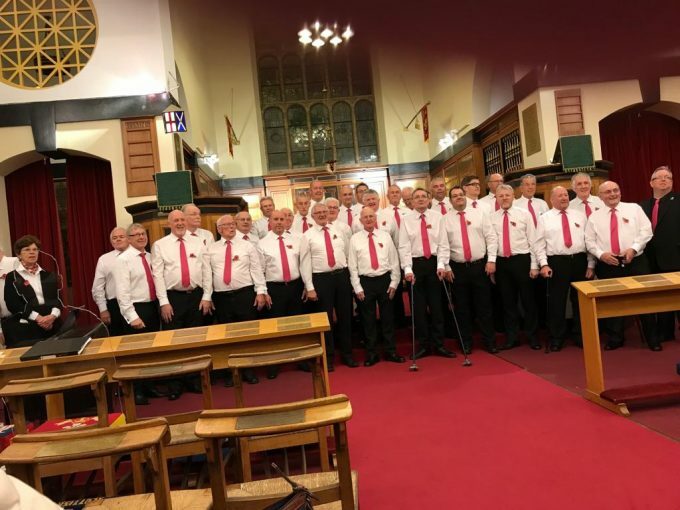 The choir presented the Church with a Welsh Flag during the evening concert. The Ddraig Goch replaced the George Cross for a period of remembrance for the Welsh troops that had fallen during the Great War in that area. The choir also visited the Commonwealth Military Cemetery at Tyne Cot which is the largest military cemetery of 12,000 fallen soldiers of which about 70% were never identified with their tombstones marked “Known Unto God’. In addition the rear walls of the cemetery have the names of another 35,000 honoring soldiers who have no known graves. The choir laid a wreath at the base of the Cross of Sacrifice at the centre of this cemetery. 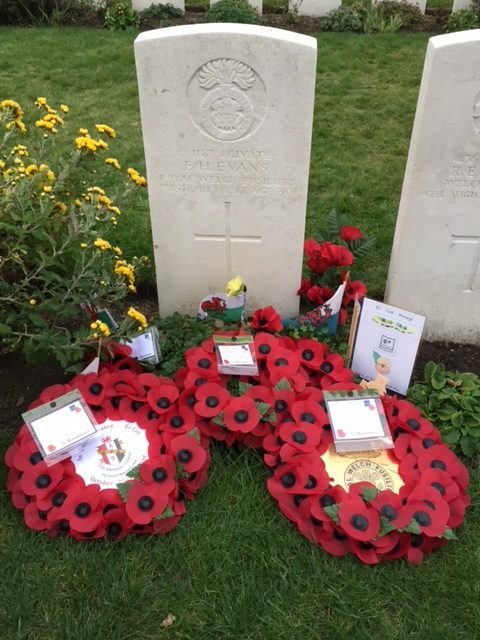 The choir visited other cemeteries including Sanctuary Wood where the grave of a great uncle of one of our late choristers Keith Sandford was laid to rest. His name was George Frederick Sandford of the Royal Welch Fusiliers from Penrhynside near Llandudno who was killed in action on the 29th of October 1914 aged 24. Co-incidentally it was the same date of the 29th October that the choir visited his grave and where Keith’s sister, Christine O’Malley a great niece, who was also on the choir tour laid a wreath. Artillery Wood Cemetery was also visited to pay our respects and hold a short service of remembrance and laying of a wreath at the grave of Hedd Wyn the bard from Trawsfynydd (Ellis Humphrey Evans) who was killed on the first day of the Battle of Passchendaele 31st July 1917, he was 30 years old. He was posthumously awarded the bard’s chair the following August 1917 at the National Eisteddfod in Birkenhead. The chair itself had been carved by a Belgian craftsman Eugeen Vanfleteren who himself had fled from Belgium. The Welsh Memorial at Habegos was visited and a wreath was laid followed by a meal and a Noson Lawen at the nearby Marc’s Restaurant De Sportsman. The town of Poperinge was part of unoccupied Belgium during the Great War where Chaplains Neville Talbot and “Tubby “ Clayton opened a club for rest and recreation to soldiers of all ranks. A visit to this the Talbot House and its museum proved to be very interesting and included a ‘sing song’ around the original 1917 piano that’s still playable after over 100 years. This house was the foundation for the international TocH movement, which is still active today. One of our 2nd Bass Choristers Dr Chris Davies found the tour to be closer to his personal life than he first expected. Here is a short account in his own words: “I have known the name of Capt Noel Chavasse for many years. He is one of only three men to have been awarded a double VC during the 1st World War. Sadly the second one was awarded posthumously. He was a Captain in the RAMC (Royal Army Medical Corps) and his father The Lord Bishop of Liverpool founded St Peter’s College Oxford where I was fortunate to go for the first 4 years of my medical training. A full length portrait of Capt Chavasse hung on the stairway leading up to the dining hall. I knew his story quite well but I did not know exactly where he was buried. I was intrigued therefore, on the choir’s recent visit to Ypres, to learn from our guide when he mentioned the three men who had been awarded double VCs, that Capt Chavasse’s grave was in a cemetery in the village of Brandhoek only 6 kilometres or so from Ypres. The day before we left Belgium our coach driver needed to get some more fuel and fortunately for me Brandhoek was on his route. He kindly dropped me off at that village and so I was able to locate and take a photograph of Capt Chavasse’s gravestone and pay my respects to an exceptionally compassionate and courageous doctor. As well as treating and bringing men back from no man’s land he had some dreadful wounds to attend to. We were able to read about some of these in the Talbot House museum in the nearby town of Poperinge.It is recorded that ‘two surgeons in one night did 112 operations’. Modern surgeons find it difficult to imagine how those Army doctors coped. This was for me an exceptionally thought provoking visit to the battlefields and cemeteries. The tour also included a visit to Sanctuary Wood Museum and Flanders Field Museum which both proved to be very emotive and informative about the Great War itself. The tour was an important part of the choir’s commitment this year to show it’s respect for the lives lost during the war, the reception by the Belgian people was superb and the choir is left with very fond memories, both emotional and enjoyable and considered it a privilege to be involved in the week building up to the centenary of the end of the Great War. To complete the week and closer to home on the following Sunday of our return the choir took part in a Commemorative Service of dedication of a plaque with a further 25 names of locals who died as a result of military conflict in war. The service was held In St John’s Old Colwyn and the plaque will be in place on the Cenotaph In Old Colwyn in time for the Armistice Service on the following Sunday.